Ready for the cold & flu season? In the transition from Summer to Fall, people often catch Cold or Flu during this period. 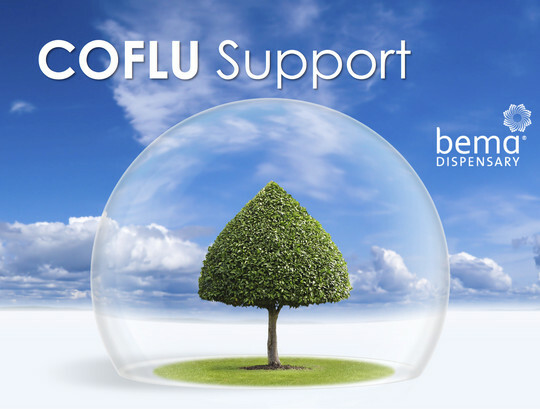 It will be a perfect time to consider providing your patients with some of BEMA’s featured COFLU support. It is well designed to handle the initial stage of either Wind-Cold or Wind-Heat patterns. Buy 10 bottles, get 2 bottles free! COFLU SUPPORT is specially designed to help treat patients that are sensitive to the rapidly changing temperatures brought about by the new season. It is effective at preventing and alleviating the symptoms of colds and flus, a great remedy to keep on hand at home. The CoFlu Support is crafted from seven carefully chosen herbal ingredients. The formula itself was produced from years of clinical knowledge and experience in Traditional Chinese Medicine and western Pharmacology. Honeysuckle Flower (Jin Yin Hua) - Since ancient times, it has been known as the detoxification remedy. It is has a cooling effect, but it does not upset the stomach. A great choice for detoxification and treating symptoms brought about by warmer temperatures. Japanese Catnip (Jing Jie) – An herb with multiple uses and properties. Known to provide antipyretic, anti-inflammatory and analgesic effects. Can also provide asthma and allergy relief. It is a good choice for treating symptoms like nasal congestion, runny nose, mild fevers, chills and various bronchial disorders. Perilla Leaf (Zi Su Ye) – Stimulates sweat secretion from sweat glands. Promotes sweat activity to help the body cool down from fevers. It can be used to reduce coughing and mucus secretion. It can also reduce sensitivity to allergies. Scute (Huang Qin) – Can improve the body’s immune system and enhance white blood cell function. Has detoxification properties and can help prevent the flu. Dandelion (Pu Gong Yin) – According to the “Compendium of Materia Medica”, it is mild and bitter. Has detoxification properties and anti-inflammatory effect. Known to be rich in vitamin A and C as well as various minerals. Good for treating indigestion and constipation as well as respiratory infections. Propolis (Feng Jiao) – A resinous mixture with antibacterial properties. It can be used to make cough drops and syrups to reduce coughing and throat irritation. Boosts immune system and promotes macrophage function. Andrographis (Chuan Xin Lian) – An herb suitable for treating fevers, colds, sore throat and other respiratory illnesses. It has detoxifying and cooling properties. It can help decrease body swelling. A good herb to keep on hand for home remedies. It can also be used to treat acute tonsillitis, enteritis, laryngitis, pneumonia and the flu.